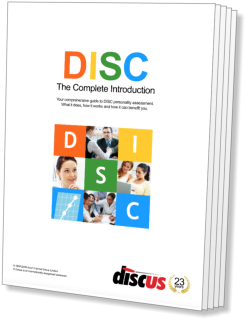 We have looked in some detail at the ways in which DISC can be used to describe an individual's behaviour. As well as this, a DISC profile can also be used to describe an ideal type for a particular job, a property that makes 'Job Matching' possible. This is the process of comparing an ideal DISC shape against one or more actual candidates' profiles, making it possible to quantify the suitability of each candidate for a position. Before embarking on a discussion of Job Matching, it is important to point out that the behavioural aspects only represent a part of the equation. Other factors such as qualifications and work experience also have an important part to play in making decisions of the kind discussed in this section. When we use terms such as 'suitability' within this guide, they refer specifically to the behaviour. It should always be borne in mind that there are other factors affecting any individual's fitness for a particular role, and that behaviour only represents one piece of the puzzle. Before Job Matching can be used, it is necessary to construct a picture of the ideal style for a job. The model, called a Job Profile (or, occasionally, a Job Template) describes the levels of Dominance, Influence, Steadiness and Compliance representing the optimum style to fulfil the position. To illustrate, consider the requirements for work in Direct Sales - to succeed, a candidate will need a powerful, determined approach with strong communication skills, a tenacious and urgent pace, and an independent nature to work effectively with little or no supervision. For a full description of this type, see High Dominance and Influence. The considerations appropriate to any job will vary from organisation to organisation. To continue the example above, there are positions in direct sales that need a sense of cooperativeness rather than independence, expecting candidates to work in closely supervised environments. In situations of this kind, a higher Compliance score will be necessary. How is a Job Profile constructed? There are various ways of achieving this, but typically a Job Profile will be produced in a very similar way to an ordinary DISC profile, through the use of a questionnaire. This questionnaire will cover the specific requirements of the job, in behavioural terms, rather than issues relating to an individual's approach. Once a Job Profile has been produced for a particular role, it can be compared against candidates for that position, or individuals already holding the post. This makes it possible to measure their suitability for that position, greatly accelerating the recruitment and assessment process. The nature of this procedure makes it ripe for automation, and computerised DISC systems usually offer some kind of Job Matching feature, but it can also be performed manually. Comparison of an individual's DISC profile against a predefined Job Profile can provide a wealth of information. By checking the differences between the DISC factors and sub-traits within the Job Profile against those of the candidate, it becomes possible to isolate areas in which a person is particularly well-suited to a role, and also detect those aspects of their behaviour that might have difficulty in adapting to a position. Further, by comparing the Job Profile against the 'Internal' and 'External' profiles in turn, useful information can be gleaned about the way a person is adapting to their role. We look at this matter in greater detail in the Addressing Specific Problems section.